Is the Poodle a Good Hypoallergenic Dog? Is the toy poodle hypoallergenic? How about a standard poodle? That’s a good question, especially if you’re allergic to dogs. You might think it’s impossible for you to ever have a fuzzy little buddy. Not so. I’ve covered all kinds of hypoallergenic dog breeds, but there’s one that always comes up in dog threads: the poodle. Today, we’ll learn about the different types of poodles and find out if they’re hypoallergenic! So here’s the low down on being allergic to dogs: you’re not allergic to the dog itself. You’re allergic to the things a dog produces. That’s why there is really NO hypoallergenic dog. That being said, “hypoallergenic dogs” have something that other allergenic dogs don’t have – a lack of shedding. See, when a dog sheds, all of the stuff you’re allergic to goes flying and floating around in the air. Dogs lick themselves, they sometimes splash urine on their fur when they go potty, and whenever hair sheds, a little dead skin goes with it. So if you have a shedding dog in the house, you have all of those allergens all up in your eyes, nose, and sometimes mouth. A hypoallergenic dog is a dog that doesn’t shed, so all of that stuff stays on your dog for the most part. Does the poodle fit that bill? We’re going to talk about that in a minute, but first, let’s talk about the different types of poodles. While there are many different names for different-sized poodles, the AKC recognized only three: the standard, the miniature, and the toy poodle. The others, like the teacup poodle, are not recognized by the organization. Let’s learn a bit more about each one. The Standard Poodle is the largest of the poodle breed, standing between 15-24 inches tall and weighing between 45-70 pounds. The miniature poodle stands between 11-15 inches tall and weighs between 14-18 pounds. The toy poodle is, obviously, the smallest of the three recognized breeds. They weigh less than 10 pounds and stand between 8 to 10 inches high at the shoulder. Don’t they look like little stuffed animals? Where did Poodles come from? While no one is quite sure of the exact origins, many dog historians believe that the breed first gained popularity in Germany, where it was called the pudelhound. Other sources say that poodles may have descended from an Asian dog breed. Today, however, the Poodle is the official dog of France! Where ever they came from, poodles were used as “water retrievers” throughout France and Germany. Basically, they’d go in and grab ducks and other water fowl during hunting trips. To this day, poodles still have a water-resistant coat and webbed feet to help them swim. What do the different poodles have in common? Now, let’s find out if the standard, mini, and toy poodles are hypoallergenic! Long story short- yes, all of the poodle varieties are hypoallergenic. If you’re allergic to dogs, they won’t – or they will rarely – trigger your allergies. But that’s only one part of it. In addition to going easy on your allergies, they are also super smart, affectionate, eager to please, and generally fun loving, warm-hearted creatures. Which means, you’ll have a dog that is not only easy to train but who is a joy to be around and easy to get along with. Because of their high intelligence level and sensitivity, poodles are often used as service dogs. If you’re also looking for a dog that bonds with the whole family (versus just one person), the poodle is the way to go! Another bonus is that the standard, mini and toy poodle varieties share all of these traits. So whether you live in the wide open country or an apartment in downtown NYC, you can have one of these awesome dogs. But wait, there’s more! Another amazing bonus is that Poodles are exceptionally long-lived! When I worked at the vet, we had a toy poodle who lived to be 26 years old. She actually came with the paperwork when we adopted her from an elderly owner. So it was legit. Poodles are excellent additions to any family, and because they come in both standard and toy sizes AND they’re hypoallergenic dogs, they make the perfect pet for almost any family or individual. As always, make adoption your first options. Visit your local shelter or look online for breed specific rescue website. More than likely, you’ll find a great poodle buddy who you can pal around with for years to come. 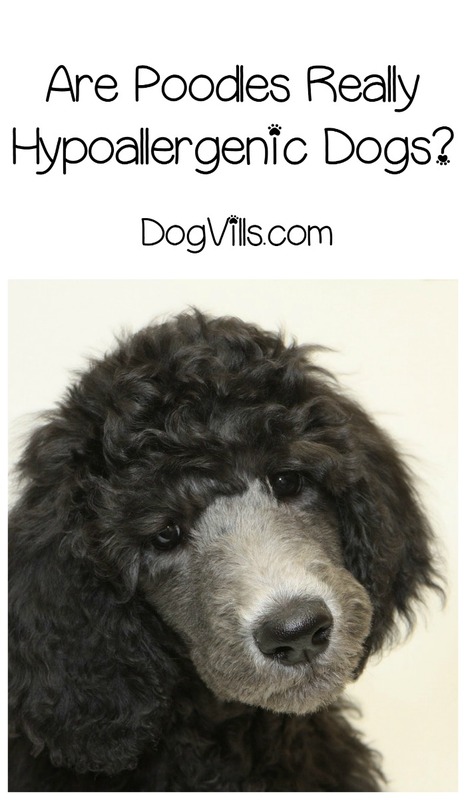 To sum up, “are poodles hypoallergenic?” You bet! Do you have a poodle? What do you love about the breed?